I sat down with Dilip Bhatia, Vice President, Global PC Design and Marketing at Lenovo, to discuss the company's vision for its laptop range, less than a day after it launched the third iteration of its Yoga Pro range. Bhatia came to Lenovo when the latter acquired IBM's PC business range nearly 10 years ago and helped maintain (and cement) the status of the ThinkPad range as one of the best laptop families in the world. The acquisition brought in a team of highly qualified engineers, a brand with a lot of goodwill on the market, IP, IBM's international network and its manufacturing technology. Oh, and an exceptional PR platform as well as the Chinese company previously known as Legend was thrusted into international limelight overnight. But its success relied on engineers as much as on customers and the Lenovo Yoga 3 Pro, Bhatia stated, is a culmination of research efforts that started by observing the world around them. A good example of that philosophy can be found in the design of the award winning ThinkPad, a 22-year old portfolio, that was originally inspired by the black Shokado Bento lunch boxes. The Yoga 3 Pro and the Yoga tablets though have been inspired by the humble physical journal (Bhatia used the expression, "Journal Design Language"). "Design has to stand for something and there's a certain amount of DNA that goes into the design of the Yoga 3 Pro [from that Bento box]; "stylish", "premium", "adaptable", "simplicity" were some keywords mentioned during our research". I also probed him about Lenovo's relationship with Microsoft and Windows 10. "I like the direction and simplicity", Bhatia said. "Bringing back the Startup menu is a great move, meaning that Microsoft listened to its customers but while that might get rid of the edge swipe, it won't kill the switch to touchscreen display". But he did confirm that Lenovo would neither launch a Windows RT product (leaving Microsoft to go it alone) nor a "Think" branded smartphone ("my words were distorted", he said, referring to reports published last year). Listening to customers is what Lenovo did when it came up with the Harmony software that is one of the USPs of the Yoga 3 Pro. It is essentially a crowdsourcing application recommendation service that provides with a list of top applications sourced from the Windows ecosystem, one that's continually updated based on customer feedback. What's next for Lenovo? He hinted that CES next year is likely to be a major event for the Chinese company. Despite being primarily a consumer-focused event, the ThinkPad X1 Carbon was unveiled there. In hindsight, IFA also saw the launch of a number of Thinkpad models. For the Yoga family, there's more in the pipeline when it comes to thinner and lighter models. 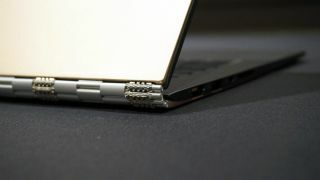 Bhatia mentioned that prototypes of a sub-10mm laptop are already here but still need to be refined especially when it come with the tactile experience. "Weight is more important than thickness", he quipped, before adding that the engineers' goal was to keep keep battery life at nine hours, which explains why the battery capacity in the new Lenovo Yoga 3 Pro has been cut by 14%, that was probably the biggest factor in the weight reduction. Ultimately, the Yoga 3 Pro is all about form over function. For those looking for something different, there's always the Thinkpad X1 Carbon that panders for more business-focused users, one that's significantly thicker but also offers more connectivity options and advanced enterprise features.